BOOZE! Because no great party started with a glass of milk. Here’s a how-to guide for setting up a basic beer, wine and soft drink bar for your party or wedding. We don’t have a liquor licence so the cost of setting up a bar is cheaper for you, but we can provide smiling people to serve at your bar who are guns at pouring a drink. Calculating how much and what people are going to drink at your party or wedding can be the trickiest part of setting up a bar. 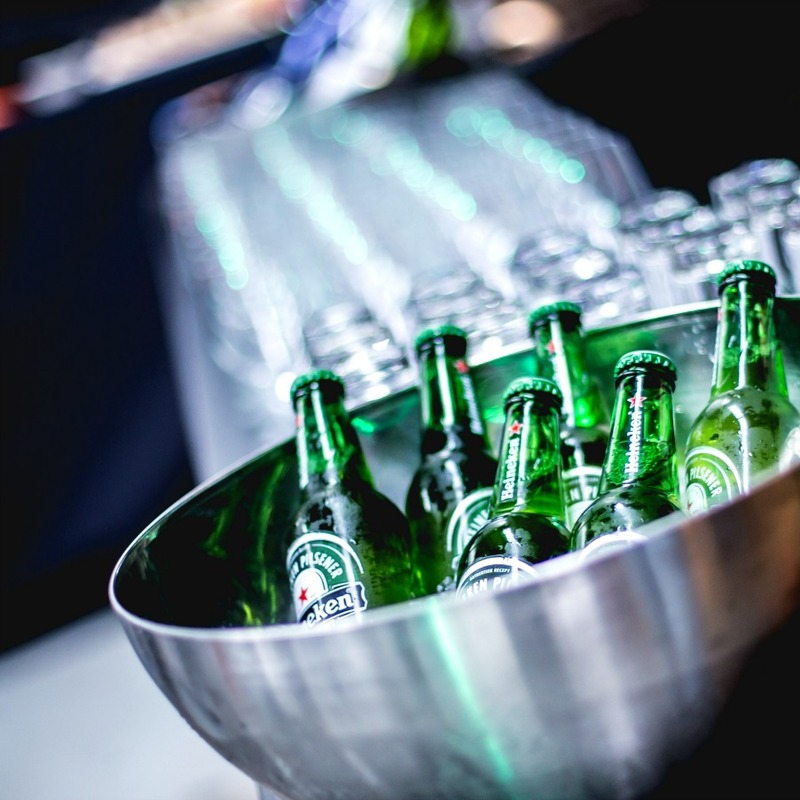 Roughly expect your guests to want three drinks each in the first two hours, and an additional drink per hour after that – based on responsible serving of alcohol. I haven’t seen many ‘responsible drinkers’ at 11pm at a Saturday night party, if you get my drift. I use the Dan Murphy’s drinks calculator then double it for a party, and triple it for a wedding. But GET MORE CHAMPAGNE than you think you’ll need. Also – you know your mates – if you think they’ll drink more of something than something else throw more of that into the mix. There is nothing wrong with a well set up self- service home bar. I have never seen anyone too precious to grab a drink for themselves, or complain about free grog. This little guide will help you manage the task – it’s super easy once you know what to do. On the other hand, getting one of our lovelies to manage your bar takes the worry out of your hands. Someone to rotate drinks, serve your mates with a smile, pick up the empties and keep everything running like clock-work. Then, they can set it up as an efficient self-service bar for the end of the night. Win. Win. A couple of trestle tables, with tablecloths and a bunch of flowers looks perfect with the glasses lined up, a water jug, an example of each drink on offer. Beer – Stubbies are great for beer so you won’t need glasses. Wine – 2 wine glasses per wine drinker. 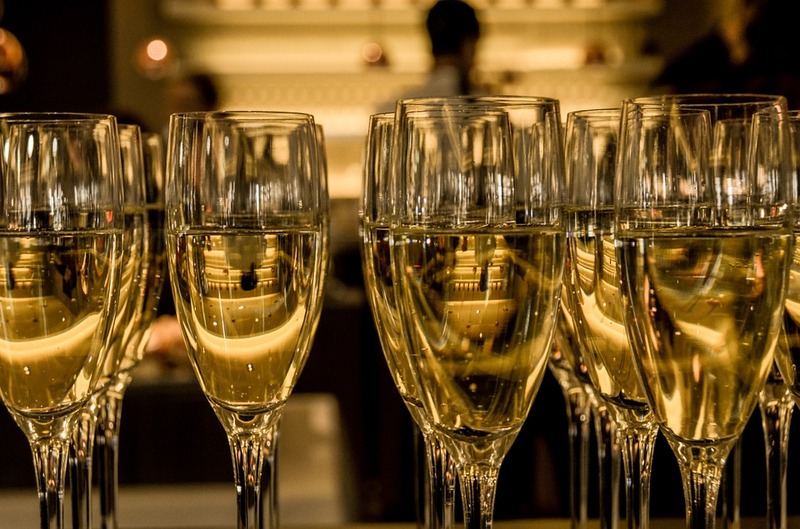 Champagne – 2 champagne glasses per champagne drinker. Water and Soft Drink – using wine glasses for water or soft drink is fine. Using paper or plastic cups as a backup to sit next to the water is normal too. (Try to get 200ml disposable cups – those big red things that are fashionable at the moment are a whopping 600ml and we’ve thrown out an ocean-load of unfinished drink from these). 3 ice tubs – one for beer, one for champers, one for softies and whites. Unbroken beer and wine boxes to store recycling bottles in – it’s not all going to fit in a standard service, so you’ll want something to store the excess in whilst you wait for the next recycling round. Easy access to your recycling bin. Nominate someone to do a quick glass and bottle pick up throughout the evening. Keep your dishwasher clear at the beginning of the night so it’s easy to bang a load of glasses through if need be. Ice melts, people spill drinks, condensation – lots of reasons to have a few towels on hand. Although most wine bottle are screw top these days, there are lots of craft beer varieties without twist tops. We prefer to use waiter’s friends – small, efficient and cheap. Jugs of tap water is fine. You can spruce it up with mint, lemon or lime wedges, a few sprigs of thyme or rosemary. Although flavoured water is a nice touch, you’ll actually be refilling with plain water as the night goes on. Some people like the fancy glass drink dispensers with the tap – please pride a plastic jug to fill them up as they get slippery with the condensation and are awkward to refill. Jugs have been around since forever – because they work good. However you do it, please provide your guests with ample water at the bar. Place the bar away from the kitchen or doorway where the food is coming from to avoid a bottleneck. Lots of party action happens close to the bar, but it makes it hard to move about if it’s too close to the kitchen. Avoid having the bar set up in a corner to ensure the flow of people back into the heart of the party. Preferably place the bar in front of a wall or fence – not a window. If you’re choosing a self-serve option place the bar directly against the wall/fence to prevent things falling of the back. If your using one of our bar tenders, give them enough room behind the bar to move plus space for the tubs and rubbish. Whether you’ve hired a baby cool room, using ice boxes or a fridge, please don’t keep the cold drinks in the same room as the food is coming out of. It creates mad chaos – dudes quick-stepping about all over the place. Borrow a fridge from a mate, use more tubs or eskies or ice boxes. Also, having to run between rooms to fetch a bar reload is remarkably time consuming. A great drinks cooler is an old, non-working fridge lying on its back so the door becomes the lid – huge space and great for keeping ice icy. If you are thinking about having a punch, consider putting it on a table near the bar, since the punch bowl and glasses can take up a lot of space. I recommend having the alcohol component of the punch behind the bar which people can add to – that way the non-drinkers have something delish to tipple on, and any kids floating about don’t drink the grog. Here is the link to the recipe for my Fancy Red Drink. I also have (what I think) is the best Espresso Martini recipe here. Sometimes, some people like to have a hot drink at a party. Not many – usually older people, or people driving home. A little set up next to the bar is great so all the drinks can be managed together, and don’t clog up the kitchen bench. Tea, coffee, milk, sugar, teaspoons, a little bin and 10 cups will do the trick. I have never served tea and coffee to more than 10% of party guests I’ve worked with. It is nice to have available, but not really an expectation anymore. So that’s the basics. I’ve made a checklist which you’re welcome to print it out for easy reference. We are happy to provide smiling people to staff your bar. All our bar staff have a responsible serving of alcohol certificate and are guns at pouring a drink. Bar staff are available for s minimum of 3 hours alongside any booked catering. Contact us here if you’d like us to help. And all the deliciousness you can handle can be found here.